YouTube is the most popular online network for video entertainment and educational videos. And you also use and see video, s mobile phones too. We watch and upload videos on YouTube. But you also earn money from your YouTube channel. 1: Before creating a YouTube channel, you must have a YouTube account. You can sign in with your Google "G-Mail" account, after you sign up to YouTube now you get ready to create Channel. 2: Now Upload your self created videos and, make sure you upload (High Quality) HD video. And get a number of viewers and subscribers to your YouTube Channel. 3: Now encourage people to watch your videos. To get high volume audience on your channel you may help your social media sites, like a Facebook, Google Plus, Twitter, or other social sites. You simply send your channel link to above social media networks to get high volume traffic on your channel. Do not use any copyrighted video, content on your channel, unless you have permission to upload and use this because violation of content, are illegal to use YouTube. And your videos should be genuine and advertiser friendly too. 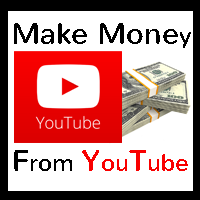 Creating an account with Google Adsense, and get (Pay Per Click) earning for the advertisement you host on your video channel on YouTube. And you get your earning via Adsense Account with YouTube partnership program. If you already have a (Google Adsense Account) so you get YouTube Partnership instantly. Come and see how 1,000's of individuals like YOU are earning their LIVING online and are fulfilling their dreams right NOW.